Painted grey, no markings. One break on the right side handlebar. Honestly it was probably stolen previously and disguised, hence the no markings. Sounds like karma. Anyways, I bought it off FB marketplace four hours before it was stolen. It's a simple bike with no fixings. 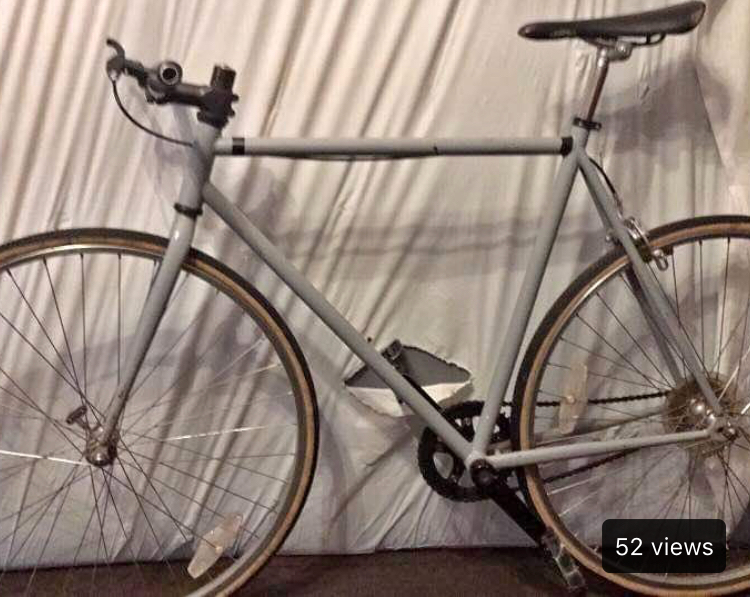 It was stolen off my front porch on Fairfield Ave in Logan Square. Not a busy street so it's likely someone in the area. I didn't have my bike lock back yet from my old bike which was kept a few streets away so I wasn't able to lock it yet. My boyfriend saw it when he left for work, and when I went down to take it to ride a half hour later is was gone. Attached photo is from the listing as I don't have any of my own photos. I would love to feel like I didn't just throw money in the trash so please let me know if you see it.